Social media use is exploding. Every day, more than 230 million pieces of content are shared on the social web¹, both by individuals and by companies. If you’re not participating in social media, you’re missing an opportunity to engage with your customers — both current and potential. Most companies think using social media means keeping a corporate blog, posting to a Twitter account and building a Facebook page. But social media use is more than that. Social interaction is happening all over the web. People are using social media not only to create original content but to share content with their friends across the web. Information about your company may exist on Facebook, Twitter, and your corporate site — but also on comment threads on local news organizations’ and magazines’ web sites, within dedicated social networks, on review sites like Yelp or GoodGuide, and more. Simplifying complex issues into digestible “bites”: Tweets and status updates have a limited character length. Good sustainability communications are simple, concrete and regular. Feeding a desire for interaction and influence: Green consumers want to share their values and proselytize the brands they believe in. Social media allows users to cultivate a following and see their ideas spread and spark discussions among others. When developing a social media strategy for your brand, think of yourself as a sommelier. Sommeliers know their stuff. They understand what makes wines great, and what makes one wine a good match for a particular meal. They know the audience they’re creating wine lists for. As a sustainability sommelier, that means understanding sustainability practices. What makes your wine “green”? What are the challenges and the risks? What are the successes? Why is a particular sustainability practice — say, a water reduction campaign or a new solar panel array — a good match for your business and brand? If you’re having trouble with powdery mildew on your vineyard, what are you doing to treat it? Where are your big waste streams and how do you address them? 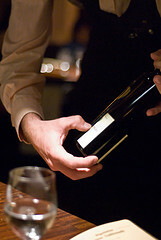 Sommeliers build a good “wine list” to share with their audience. They don’t offer up every wine they know about; they don’t even offer up every great wine they know about. They change their list based on the menu and the season. They offer a range of choice for different meals and palates, from simple and easy to consume to complex and unique. The same is true for good sustainability communications. Your “list” — all the communications you make, from press releases to tweets to advertising campaigns — should be curated carefully to reflect the practices that your audience will appreciate and understand, and that will enhance your brand’s reputation for transparency and good business practices. Choosing the right vehicle for each communication is important as well. Think of Twitter as a house red, and your blog as a premium vintage. One’s meant to be consumed regularly, casually. The other is meant to be savored. Post accordingly. Sommeliers have a lot of information about a wine. They don’t share it all. (1) Build a community of brand evangelists. 9.8% of active Internet users use their social media profile to promote a brand. 28% of boggers post opinions on products and brands. Go to where your community is and engage. Meet the influencers. Depending on who you are — a boutique producer, a national grocery-store brand, a restaurateur, etc. — your audience may be in different places. Look to news sites, wine-focused social networks, general social networks (Facebook, e.g. ), location-specific tools (Yelp, Foursquare, Gowalla) and blogs — food blogs, wine blogs, farming blogs, green blogs, etc. Don’t just talk about your company, either. Get engaged in discussions and debates that are relevant to your business, too. If you have a focus on sustainability, that means engaging in discussions about business practice, organic agriculture and more. This engagement can help you position yourself as a thought leader, and drive customers to your blog, your web site and your brand. You’ll need to make some business decisions about which of these is likely to have the biggest impact on your brand, but understand who your audience is and which options will let you reach them best. By commenting and creating your own content you become the influencer. You know what you do best and you know your audience. Share the best stuff — of your own, of your industry, of your community — with your network.